Make sure there is enough lighting. Install ceiling lighting like recessed can lights or surface-mounted fixtures. Consider a solar tube to bring in lots of natural light, especially if you have no window. I have a solar tube in my own laundry room and I just love how light and bright the room is. Add color! 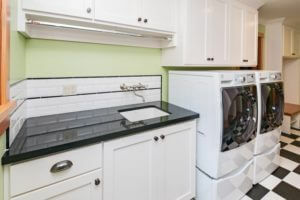 The lively green walls and black and white flooring makes this laundry room cheerful and friendly. The blue, black, white and gray color scheme is sophisticated and timeless. In my laundry room, when it came time to replace my washer and dryer, I decided to go bold: My washer and dryer are a color called Chili Pepper Red! Think about your storage needs. Laundry rooms are usually quite small, so storage space is very limited. Open cubbies can work really well for things you need to access everyday, like backpacks and shoes. Closed storage is great to hide cleaning supplies, linens, and anything else you need to store. We keep extra light bulbs and batteries in our laundry room, and I find that drawers work best for those items. Add personality with wall decor. If you have wall space, hang some artwork to add some color and whimsy. How about travel photos, kids’ artwork, or inexpensive decorative art from Home Goods? In my laundry room, I have a very cute collage my daughter made for me of clothes hanging on a clothesline. You may never actually love doing laundry, but a beautiful environment can make this everyday task more enjoyable. Anna Jacoby is a local Certified Interior Designer. Contact her at 510-378-6989 or info@annajacobyinteriors.com.If you’re starting a design or decorating project, it might be helpful for you to ask yourself the same questions a designer would ask you. When I meet with new clients, I aim to get to know you, your style, your taste and your design goals, so I know best how to help you. If you are embarking on a project on your own, these questions can help you focus and prioritize what’s most important to you and help you get started. What do you love about this room? Which elements are staying in the room and need to be incorporated into the new design? Sometimes the answer is “nothing!” But there is always something! Perhaps you like the large windows, or the wood flooring. Perhaps you have a comfortable sofa you’d like to keep, or a piece of artwork you bought on vacation. One client once told me, “everything in here can go EXCEPT my husband’s recliner!” Whatever it is, I can usually work with it. If it’s the view and the large windows you like most, I can design a seating arrangement and a window treatment that will enhance them. If it’s a piece of artwork, I can pull colors from it and design a color palette for the room. If you want to keep something because you love it, design the room to enhance it; if you have to keep it because it’s too expensive to replace right now (like not-so-attractive fireplace tile, for example), then design the room so it’s NOT the focal point. Add other elements to bring the eye to other areas in the room. What would you like to change most? Design is about aesthetics, but it is also very much about improving functionality in a space. The most common complaints I hear are: This room is too dark; the room lacks storage; I can’t figure out how to arrange the furniture as the room is too small/large/long/narrow. Fortunately all of those problems can be solved. Room too dark? Guess what-- add lighting! Recessed lights, track lights, a chandelier, pendant lights and wall sconces are all possible options. For space planning, draw the space to scale and use furniture templates to experiment with different arrangements. Not enough storage? Consider built-in cabinetry, or tall bookcases, or storage ottomans. How is this room used? And are there any colors you really don’t like? Don’t worry about what’s popular—if you find yourself still loving colors from previous decades, have no fear. Any color can be made to look new again if it’s paired with more current colors. Pore over magazine photos, Pinterest and Houzz.com to view a wide variety of beautiful color schemes. More important than being “current” however, is being happy. So choose colors you love. What is the overall look and feel you’d like to see when we are finished with the project? Do you have a favorite look or style you are trying to achieve? I’m currently working on a large design project where our design goal has been named “Modern Urban Rustic.” Having a theme like that keeps us focused when selecting furnishings and materials. For example, we are using very rustic, reclaimed wood for the floors, combined with very modern, funky light fixtures. Are there any special needs to take into consideration? This is very important. For example, if there are elderly parents or people with disabilities, you may want to stay away from area rugs, which can pose a tripping hazard. With small children, you may want to look at furniture with rounded edges or leather pieces that are easy to wipe off. Satin finish paint is also a good option for rooms where kids and pets hang out. Do you want to complete this project all at once, or over time in phases? As long as you know your long range plan, it’s OK to tackle a project in phases. However, don’t let the project take so long that you start changing your mind about your design goals, or find yourself never finishing. Sometimes this happens on a decorating project—we get the furniture purchased and walls painted, but then the clients don’t follow through with the window treatments and accessories. The result is a room that is not quite done, which can leave everyone unsatisfied. If possible, save enough money to do the whole project at once, so you get maximum bang for your buck. And speaking of money, what is your budget for this project? Is it realistic? I find that clients sometimes have no idea how much things actually cost. So while they have a budget amount in their head, it often does not match the reality of what they want. Remember that we always have to add on sales tax, shipping and delivery charges, installation charges, furniture assembly charges, labor for painting, crown molding, electrical work, granite fabrication, etc. Unfortunately things always seem to be more expensive than people think, especially in the Bay Area. Just keep this in mind when establishing a budget. How long are you planning to stay in your house? This is definitely a question that can affect your design plan. If you are planning on selling soon, then meeting with a realtor would be helpful to get an idea of the best ways to spend your design budget. If this is your long-term house, then by all means, design it for your own taste and lifestyle. Please don’t worry so much about resale if your time horizon is more than 2-3 years. Design for yourself so you can enjoy it as long as possible. Anna Jacoby is a local Certified Interior Designer. You can reach her at 510-378-6989 or by email at info@annajacobyinteriors.com. Visit her website at www.annajacobyinteriors.com.I once met with a client about redecorating her living room. She showed me around the house, which was quite beautiful, and when we got to her bedroom, she showed me a very plain room, with hand-me-down furniture, very inefficient lighting, and no decor at all. I asked her about it, wondering why we were working on her living room when her bedroom needed so much TLC. She said, “Everyone sees the living room; only my husband and I see the bedroom!” My immediate thought was: Aren’t you and your husband deserving of a beautiful space too? Master bedrooms are often the last rooms to be tackled, but, as the room you retreat to at the end of a busy day, wouldn’t it be great to move it up the priority list? Here are some tips to make your master bedroom the retreat you deserve. 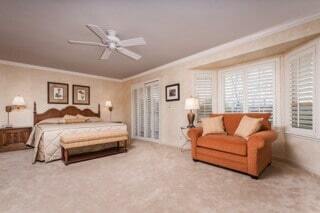 The bed is the focal point of the room, and should take center stage. It should go on the longest wall in the room, and should be the first thing you see when you enter. Besides new bedding, which I will get to in a moment, add some interest to the wall behind the bed using an accent color on the wall, or a beautiful wallpaper, or a paint technique like wide horizontal stripes. Bedside table lamps should be on the taller side— if your night stands are 24”-30” tall, then the lamps should be around 30-32” or so— to provide adequate light for reading. As an alternative, install wall-mounted light fixtures, or pendant lights above each nightstand. In my own bedroom, I asked my contractor to install pendant lights, with a dimmer switch on each side of the bed. Pendants or wall lights are a great option when you want as much room as possible on top of the bedside tables. If you like to look at decorating magazines, you’ve probably noticed a popular lighting trend: installing a hanging light fixture above the bed. This is not only a great look, but it also provides good general lighting for the entire room. Treat yourself to beautiful bedding— a duvet cover is great because it can be laundered easily, but some people prefer comforters or quilts. I like to dress a bed with a quilt or coverlet, with a folded comforter at the foot of the bed. I also really like pillows. A beautiful bed has decorative pillow shams, as well as throw pillows. Pillows add color, texture, pattern and are a perfect finishing touch. Even if you or your partner are averse to pillows (I know they end up on the floor every night), please add at least one! The bed just doesn’t look finished without decorative pillows. Every bed needs a headboard— this could be wood, iron, or upholstered. I love the look of upholstered headboards. Remember that headboards can always be re-upholstered or painted, so as you are shopping, look for shapes you like, and don’t worry too much about the color of the wood or fabric. That can always be changed. You might find a great bargain online or at a consignment store. Maybe you already have room-darkening shades or blinds— that’s great. But adding fabric will do wonders for the room. Consider curtain panels in a color that coordinates with your bedding, or a tailored valance like a box pleat or mock Roman shade style. I like to use colors and styles with a timeless quality to them, so in general, simple styles are best. 5. Add hotel room amenities. Comfortable hotel rooms have some additional seating— perhaps a chair and small table by the window, or a reading chair in the corner. If you like to work in your bedroom, consider adding a writing table or small desk for a laptop. A bench at the end of the bed is a nice place to sit and put on shoes, or lay out your clothes for the day. Think about your favorite hotel— wouldn’t it be nice to feel like you are on vacation in your own bedroom? In my closet, I have several black garments— dresses, pants, tops and shoes. Black is most definitely a color that is always in style, and one that can be dressed up or dressed down, depending on what you pair with it. It’s such a versatile color, and since it works so well in a wardrobe, it also works extremely well in interior design. If you want to decorate with black, here are some tips for you. Conquer your fears and go bold with this wonderful color. 2- Incorporate an accent color to play off the black. Black is a great foundation color. Think of a black dress dressed up with jewelry or a colorful scarf or shoes. Try pairing it with lime green or hot pink or yellow for a playful look. Try red for drama, or stick with shades of gray and whites for a sophisticated, monochromatic look. Black (or very dark brown) floors and countertops are excellent choices as foundations for a room, combined with other colors for interest. 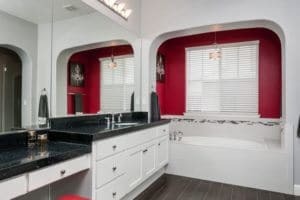 In the bathroom photo shown, please notice how well the red accent color stands up to the high-contrast black counters and white cabinets. And in the bedroom, notice how the color scheme is repeated, but in a softer version, using charcoal gray instead of black. And in the kitchen, white, black and gray look elegant and timeless. 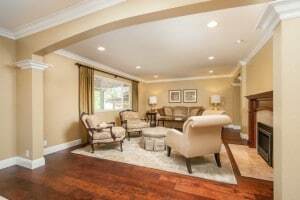 The wood floors and taupe walls keep the room from looking cold. 3- Use silver, mirror or gold to add touches of glamorous elegance. Try a crystal chandelier against a black ceiling, or a mirrored dresser in your bedroom against a black wall or on top of ebony stained wood floors. It’s spectacular. 4- Black can be used to tie things together. For example— let’s say you have some hand-me-down furniture that looks mismatched and haphazard in your room. Try painting them black— they will immediately look more cohesive and pulled together. This tip works well with mismatched picture frames too. The key to using black successfully is to make sure there is some contrast to keep it from looking too dark and flat, and some warmth to keep it from looking too cold. Probably most importantly, decorating with black will take some confidence on your part. Don’t be afraid of this classic, sophisticated color— it really can look amazing. Raise your hand if you enjoy doing laundry. Maybe there are a few hands raised out there, but probably not too many. 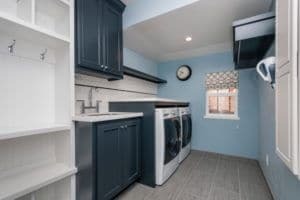 But what if your laundry room were a very pleasant place to be, rather than a cramped, dingy room with no personality? 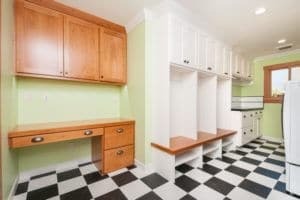 Even if you can’t undergo a large remodeling project like these two, you can at least give your space a face lift with paint, artwork, and improved organization and storage. If your budget allows, however, borrow some ideas from these two recent design projects to achieve your own beautiful and functional space. 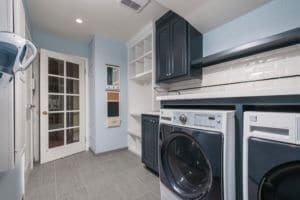 Laundry rooms are often more than just a place to wash clothes. Many laundry rooms are right off of the garage, making them the first entry point into the house. Because of this, it’s important to create space for things for more than just the washer and dryer. In these two examples, we designed multi-functional rooms, specific to the needs of the families who live in these homes. There are spaces for each child in the family to store backpacks, shoes, jackets, and ballet bags. There is a dedicated space for washing, folding and hanging clothes. There is an organizational area where important notices can be kept. The green laundry room even includes a desk for craft projects and household organization. 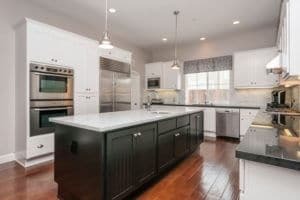 In both projects, we used highly durable surfaces such quartz countertops, tile backsplashes, and porcelain tile flooring. And both baths have a sink, which is very convenient for hand-washing delicate clothing, cleaning kids’ sticky fingers, and even washing small pets. You may never actually love doing laundry, but a beautiful environment can make this everyday task more enjoyable. Anna Jacoby is a local Certified Interior Designer. Contact her at 510-378-6989 or info@annajacobyinteriors.com. If you’re starting a design or decorating project, it might be helpful for you to ask yourself the same questions a designer would ask you. When I meet with new clients, I aim to get to know you, your style, your taste and your design goals, so I know best how to help you. If you are embarking on a project on your own, these questions can help you focus and prioritize what’s most important to you and help you get started. Whatever it is, I can usually work with it. If it’s the view and the large windows you like most, I can design a seating arrangement and a window treatment that will enhance them. If it’s a piece of artwork, I can pull colors from it and design a color palette for the room. If you want to keep something because you love it, design the room to enhance it; if you have to keep it because it’s too expensive to replace right now (like not-so-attractive fireplace tile, for example), then design the room so it’s NOT the focal point. Add other elements to bring the eye to other areas in the room. What would you like to change most? Design is about aesthetics, but it is also very much about improving functionality in a space. The most common complaints I hear are: This room is too dark; the room lacks storage; I can’t figure out how to arrange the furniture as the room is too small/large/long/narrow. Fortunately all of those problems can be solved. Room too dark? Guess what– add lighting! Recessed lights, track lights, a chandelier, pendant lights and wall sconces are all possible options. For space planning, draw the space to scale and use furniture templates to experiment with different arrangements. Not enough storage? Consider built-in cabinetry, or tall bookcases, or storage ottomans. This may seem an obvious question, but there are many ways to utilize a space. A dining room may indeed be for dining, but it also may need to serve as a meeting room for business or social gatherings; a living room may serve best as a library or home office; a guest room may need to be a room for grandkids, craft projects or even daytime napping. Anna Jacoby is a local Certified Interior Designer. You can reach her at 510-378-6989 or by email at info@annajacobyinteriors.com. Visit her website at www.annajacobyinteriors.com. I once met with a client about redecorating her living room. She showed me around the house, which was quite beautiful, and when we got to her bedroom, she showed me a very plain room, with hand-me-down furniture, very inefficient lighting, and no decor at all. I asked her about it, wondering why we were working on her living room when her bedroom needed so much TLC. She said, “Everyone sees the living room; only my husband and I see the bedroom!” My immediate thought was: Aren’t you and your husband deserving of a beautiful space too? Master bedrooms are often the last rooms to be tackled, but, as the room you retreat to at the end of a busy day, wouldn’t it be great to move it up the priority list? Here are some tips to make your master bedroom the retreat you deserve. Bedside table lamps should be on the taller side— if your night stands are 24”-30” tall, then the lamps should be around 30-32” or so— to provide adequate light for reading. As an alternative, install wall-mounted light fixtures, or pendant lights above each nightstand. 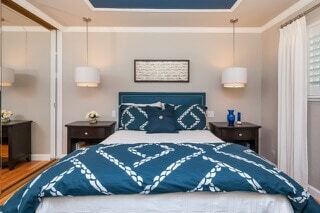 In my own bedroom, I asked my contractor to install pendant lights, with a dimmer switch on each side of the bed. Pendants or wall lights are a great option when you want as much room as possible on top of the bedside tables. If you like to look at decorating magazines, you’ve probably noticed a popular lighting trend: installing a hanging light fixture above the bed. This is not only a great look, but it also provides good general lighting for the entire room. Treat yourself to beautiful bedding— a duvet cover is great because it can be laundered easily, but some people prefer comforters or quilts. I like to dress a bed with a quilt or coverlet, with a folded comforter at the foot of the bed. I also really like pillows. A beautiful bed has decorative pillow shams, as well as throw pillows. Pillows add color, texture, pattern and are a perfect finishing touch. Even if you or your partner are averse to pillows (I know they end up on the floor every night), please add at least one! The bed just doesn’t look finished without decorative pillows. Every bed needs a headboard— this could be wood, iron, or upholstered. I love the look of upholstered headboards. Remember that headboards can always be re-upholstered or painted, so as you are shopping, look for shapes you like, and don’t worry too much about the color of the wood or fabric. That can always be changed. You might find a great bargain online or at a consignment store.